It has begun! Today is the first day of William and Kate’s tour of India, and we have already seen Kate model two different outfits. So let’s take a quick look, shall we? 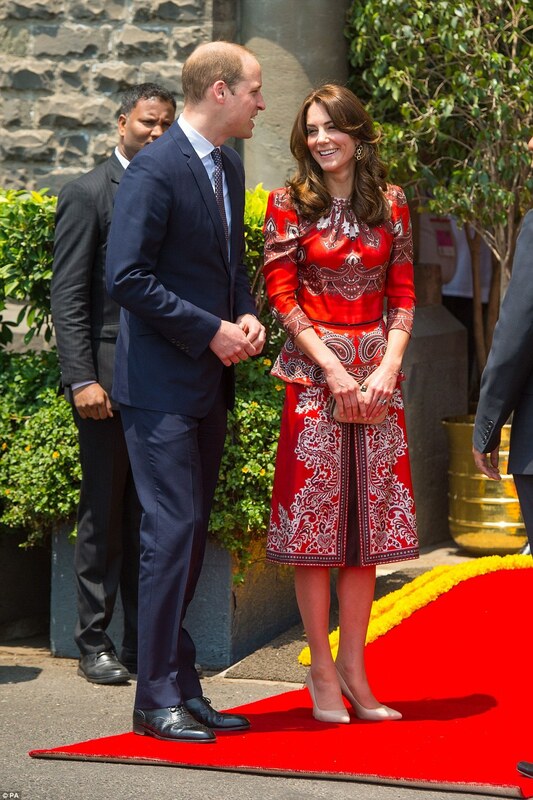 The Duke and Duchess of Cambridge arrived in Mumbai today, April 10, 2016. This is the first royal tour for the couple in two years. They were welcomed at the Taj Mahal Palace Hotel where they laid a wreath in memorial for the victims of a terrorist attack on the hotel in 2008. All pictures in this blog post are courtesy of the Daily Mail. Will and Kate arrive at the hotel. 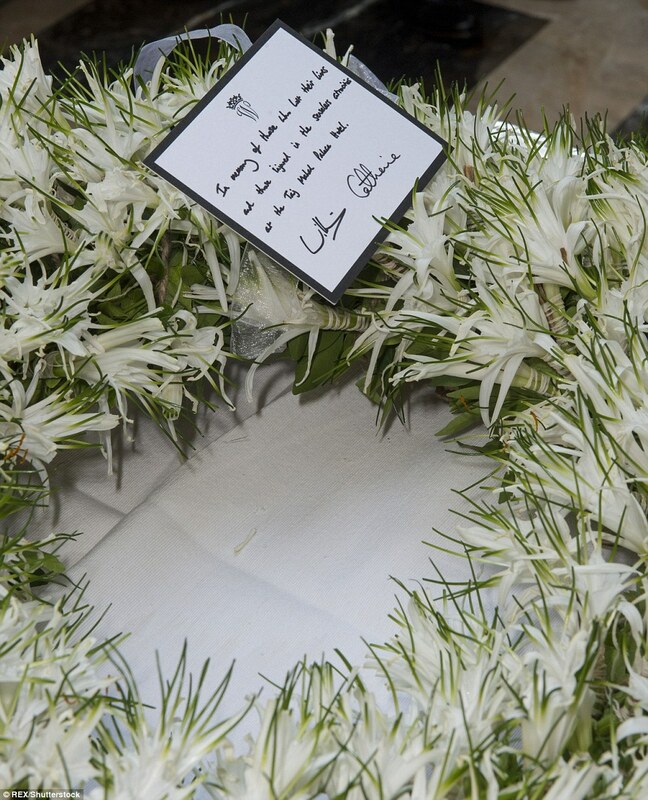 A picture of the wreath they placed in memorial at the hotel. 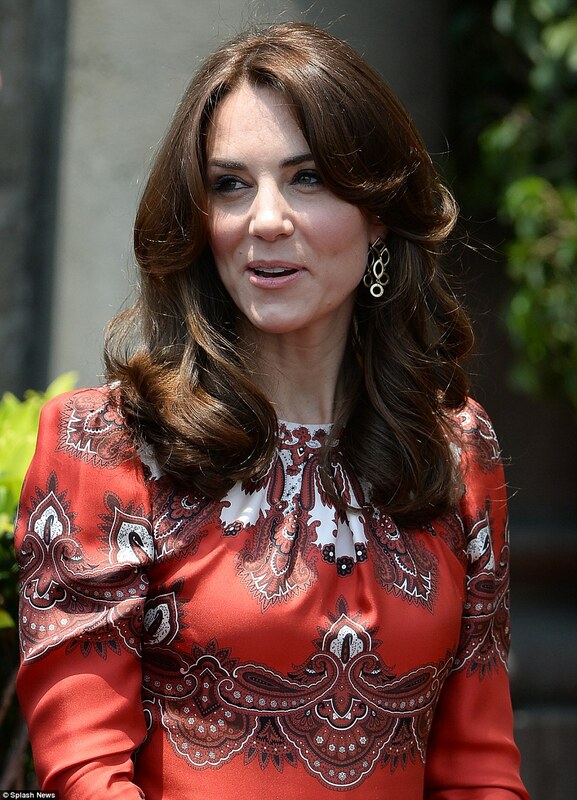 Kate arrived at the hotel wearing a lovely bespoke Alexander McQueen dress. I thought it was appropriate for her to wear McQueen, one of the most famous British fashion designers, to represent the UK fashion industry as her first big outfit for the tour. Sarah Burton for Alexander McQueen was also the designer behind Kate’s wedding gown. I am not sure if red is considered an appropriate color for laying a memorial wreath in India, but they most likely have different standards about that than we do where I am from in the U.S.
Kate also wore her Temple of Heaven earrings, which she wore a few days ago to a reception at Kensington palace for young people from India and Bhutan. Here is a picture of her wearing the earrings today. And here is a picture of her wearing the earrings at the reception. Kate wore Gianvito Rossi patent-leather pumps with her McQueen dress. Kate finished the look with a Russel and Bromley clutch. 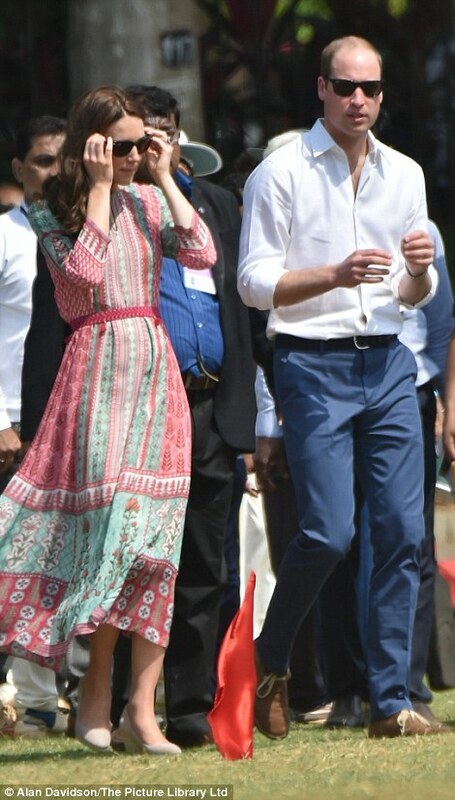 After arriving at the hotel, the royal couple had a quick outfit change before visiting the Oval Maiden in Mumbai, where they watched children play in a cricket match. First of all, I really like the dress that Kate wore. I think it is pretty and colorful. I like the shades of pink/raspberry and light blue. But it looks really, really hot in Mumbai so I think it would have been appropriate for Kate to put her hair up before watching the match. As a woman with hair longer than Kate’s that’s the first thing I would have done. Plus, if Kate had pulled her hair back we could get a better look at the earrings she wore which were definitely not the Temple of Heaven earrings she wore with the McQueen dress. This dress is a bespoke piece by Anita Dongre, an Indian designer from West Mumbai. According to Anita’s twitter, this piece is a Mughal inspired tunic. This is what the tunic originally looked like during Lakme fashion week, but as the piece is bespoke it was reworked a bit to suit Kate’s taste and needs. Specifically, Kate’s version appears to be considerably shorter. My goodness, Kate didn’t just watch a cricket match, she played with kids through an obstacle course while wearing a dress and wedge heels. I would probably break my ankle if I tried this!!! Kate is known for being really sporty, though. So maybe it doesn’t bother her? Looks uncomfortable to me, but she seems to be enjoying herself! It’s nice to see her happy. She always seems happiest when she is playing sports. See more pictures from the Telegraph here. 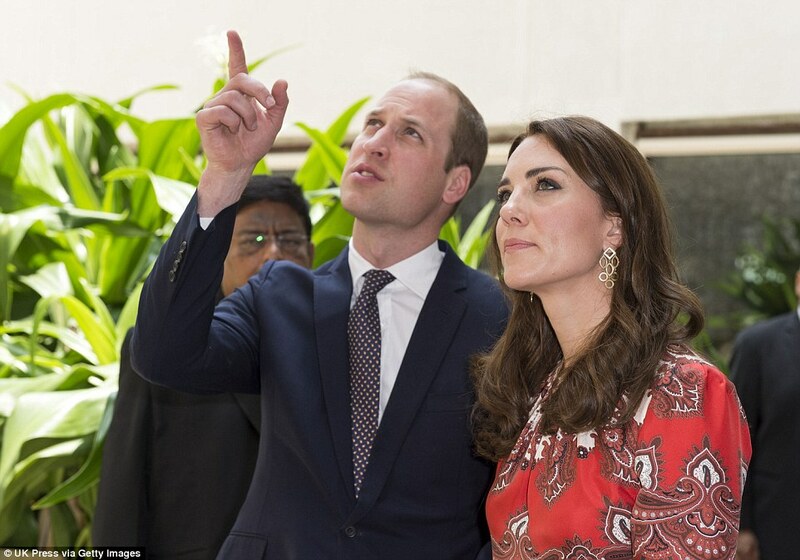 Watch this space for more updates on William and Kate’s tour! Tonight, the Cambridges will attend a Bollywood star studded gala where Kate will wear a formal evening gown and I will be sure to write a post about that, so stay tuned and follow My Frugal Lady on Facebook!